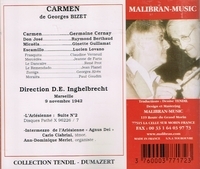 "The [above] 1942 Cernay-Inghelbrecht broadcast...cuts much of the dialogue but emerges as the most persuasive Opéra-Comique CARMEN recorded since the acoustic era." "Germaine Cernay was born Germaine Pointu in Le Havre, studied at the Paris Conservatory with Henri Albers and Emile Engel, making her debut at the Opéra-Comique in 1927 in the Paris premiere of Alfano's RESURREZIONE, opposite Mary Garden and René Maison. Her Salle Favart roles included Charlotte (WERTHER), Margared (LE ROI D'YS), Mignon, Suzuki (MADAMA BUTTERFLY), and Mallika (LAKME). Outside of France she appeared in Belgium and Switzerland, as well as in North Africa. In 1942 she sang the role of Geneviève in the first complete recording of PELLEAS ET MELISANDE under the baton of Roger Désormière. Cernay died prematurely a year later in Paris." ï¿½Cernay made her dï¿½but at the Opï¿½ra-Comique in Paris on 16 May 1927 as la Bossue in the Paris premiere of Alfanoï¿½s RISURREZIONE (in French). Other creations at the Salle Favart were Floriane in ï¿½ROS VAINQUEUR (de Brï¿½ville), la Tour in LE FOU DE LA DAME (Delannoy), a fairy in RIQUET A LA HOUPPE (Hue), and Lï¿½onor in LE SICILIEN (Letorey). Her other principal roles at the Opï¿½ra-Comique included Sï¿½lysette (ARIANE ET BARBE-BLEUE), a sister (Bï¿½ATRICE), Gertrude (LE ROI DAGOBERT), la fantï¿½me (LES CONTES D'HOFFMANN), Mallika (LAKMï¿½), Javotte (MANON), title role in MIGNON, Souzouki (MADAMA BUTTERFLY), Vincenette/Taven (MIREILLE), Geneviï¿½ve (PELLï¿½AS ET Mï¿½LISANDE), Clï¿½one (Pï¿½Nï¿½LOPE), Charlotte (WERTHER) and one of the voices in MASQUES ET BERGAMASQUES. She was invited to many provincial centres in France and also appeared in North Africa, Switzerland, Belgium, England, Ireland and Italy. Broadcasting on French radio allowed Cernay to enlarge her repertoire to roles in CARMEN, LE ROI Dï¿½YS, LE CHEMINEAU, LA DAMNATION DE FAUST, DON QUICHOTTE and LA Lï¿½PREUSE. She also sang in the first performance of surviving fragments of Chabrier's VAUCOCHARD ET FILS on 22 April 1941 at the Salle du Conservatoire. Cernay was one of best-known concert altos of her generation and highly considered as a Bach interpreter. She appeared regularly with the Orchestre de la Societï¿½ des Concerts du Conservatoire from 1931 to 1942. Her first and last appearances with the orchestra were as alto soloist in the Bach MAGNIFICAT, and in 1936 she sang in two performances of the Mass in b minor. She retired in 1942 to become a nun. A year later she died of status epilepticus." ï¿½The first performance of Debussyï¿½s PELLEAS ET MELISANDE in 1902 made a major impact upon Inghelbrecht and he was to be associated with the music of that composer throughout his life. Jacques Rouche engaged Inghelbrecht as conductor at the Theatre des Arts in 1908, where he directed the first performance of Florent Schmittï¿½s LA TRAGEDIE DE SALOME, and in 1911 he was chorusmaster for the stage premiï¿½re of Debussyï¿½s mystery-play with dance, LE MARTYRE DE SAINT SEBASTIEN; he later conducted with distinction its revival as a concert piece in 1912. In order to give Paris a first-class choir, Inghelbrecht founded the Association Chorale Professionelle in 1912 and in the same year was appointed director of music at the newly constructed Theatre des Champs-Elysees, where he conducted the theatreï¿½s opening season productions. These included Berliozï¿½s BENVENUTO CELLINI, Mussorgskyï¿½s BORIS GODUNOV, and Dukasï¿½ LA PERI. After World War I, in 1919 Inghelbrecht founded the Concerts Pleyel with the objective of performing the music of the seventeenth and eighteenth centuries. He toured Europe with the Ballets Suedois between 1920 and 1923, conducting the first performances of LES MARIES DE LA TOUR EIFFEL by Les Six, and Milhaudï¿½s Lï¿½HOMME ET SON DESIR (both in 1921) and on his return to France became chief conductor at the Opera-Comique, Paris (1924ï¿½1925). He then held a succession of posts - second conductor at the Concerts Pasdeloup (1928ï¿½1932), chief conductor of the Algerian Opera (1929ï¿½1930), and once again chief conductor at the Opera-Comique (1932ï¿½1933) - before embarking upon his major achievement: the formation in 1934 of the top radio orchestra in France, the Orchestre National de Radio France, of which he was chief conductor until the liberation of France at the end of World War II. He continued to conduct this orchestra until the end of his life, including on tour to England in 1953, even during the years (1945ï¿½1950) when he was chief conductor at the Paris Opera.